Who needs AT to help with math? A number of learning and attention issues can cause trouble with math, but AT can be a huge help for students. Dyscalculia is one of the most common issues. As of right now, very few special education students actually advance into upper level mathematics. Because of this, many students who struggle with mathematics become divided from their peers, and thus experience great difficulty in their future education. What types of Assistive Technology (AT) tools are there for math support? Certain AT tools for math are common such as calculators and graph paper. There are lots of other AT tools that can be used for math such as “low-tech” graph paper and rulers. Other AT supports include common adaptive tools such as manipulatives like blocks and number lines. Manipulatives are real or virtual objects that let kids solve math problems in alternative ways. More math AT includes math notation tools, digital graphing tools, drawing tools, equation-solving tools, graphic organizers, text-to-speech, and dictation. Why? Building mathematical skill has lifelong implications for students but can be easily overlooked. Basic life tasks such as paying bills, balancing a checkbook, creating budgets, arriving at work on time, and measuring are independent living skills that we all use. The ability to understand and think critically about numbers is vital for students to operate successfully in the real world. How? Teaching mathematics then can no longer focus just on teaching procedures and providing students with the bare minimum knowledge of facts and equations. Students need to know why they are doing what they are doing. They need to understand the process of math, rather than simply know how to use it. The bigger picture is how to assist students in gaining an understanding of the language of numbers and apply what they know to the problems they are encountering. Where to access AT for math? You can find traditional “low-tech” classroom items such as large number papers, symbols, and graph paper with large graph squares at school supply stores. The student’s teacher may also have these items at the school. Schools will typically have adaptive tools to use for math issues such as manipulatives which are blocks and/or number lines. Many math AT tools are being used on computer platforms such as desktop and laptop computers with built-in AT options like text-to- speech; mobile devices like tablets and smartphones with built in AT; and Chromebooks and Chrome browser with math extensions downloaded. Below, you'll find videos explaining assistive technology related to Mathematics (and other Learning, Cognition & Development topics). You can click the graphic to play all six videos consecutively. Or, when you get to YouTube, you can select from the LCD playlist. Here's INDATA's YouTube video playlist for Tech Tips for Education (including several videos involving Mathematics). There are many reasons why students can have trouble with math. Math difficulty often involves trouble with counting and memorizing facts. Dyscalculia is a learning issue that is a common source of math trouble, but other issues can have similar symptoms or co-occur with it. There are many ways to help kids get better at working with numbers, and assistive technology can be a huge help for students with math issues like dyscalculia. Certain AT tools for math are common, like calculators and graph paper. But there are lots of other AT tools that can be used for math. It’s important to also understand how the individual student struggles with math. Understood.org has a helpful chart describing various math support needs. 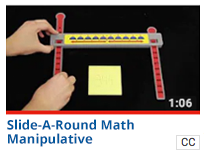 Manipulatives help students solve math problems in alternative ways and can be physical objects or virtual objects on computers: math or number lines allow the student a physical counting system to add or subtract numbers without having to write down any numbers or symbols. Abacus: calculate by moving beads. Blocks, coins, or tangrams are tangible and allow students to interact with mathematical problems in a physical and visual manner. Graph paper grids make it easier to line up numbers and symbols in math problems. Students with math issues may prefer graph paper with large squares. Some may prefer to use digital graph paper. Calculators are used for simple math problems like addition and subtraction to more complex equations. 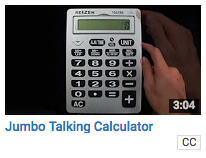 Calculators with large buttons, numbers, and symbols may be preferred. 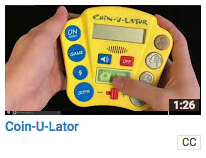 Coinulators help students learn how to add and subtract money. Talking measuring tapes, scales,and thermometers help students who have trouble reading numbers by telling them the exact amount or number present. A watchminder verbally states the time and some timers can allow students to visually see the passage of time as they work on a task. Create math charts for students to reference that contain conversions, equations and other useful information that are located on a single piece of paper. Student is in 3rd grade and struggles with math. A third grader struggling with money and rounding concepts was able to understand the concepts better once she began using a “Slide-A-Round Math Manipulative” to work on rounding numbers and a “Coin-U-Lator” to learn about the value of money and to add and subtract. The goal is for the student to use the Coinulator at the math and money station during class time and will use the Coin Math app at home and in the car. The money unit will end in a few weeks, so the goal is to progress in understanding money units as well as the concept of rounding up and down on a number line. Student is in 8th grade struggling with basic math concepts. A student in 8th grade was struggling with math concepts in general so the teacher met with him about working with physical and virtual manipulatives. Manipulatives can be helpful for illustrating abstract math concepts. Physical objects help students visualize relationships and applications. The teacher had the student borrow a MathLine which is a simple rod with rings and a printed number line with which students can learn math concepts by touching and moving the rings, grouping numbers, and can see the visual number on the rod. The Mathline is a little like an abacus, but it is better in that students can see the numbers and an abacus has no numbers visible. Students can comprehend the mathline because it has direct correspondence between the object and number so students can model core math concepts such as early math (counting and skip counting), place value, and rounding. The mathline can teach more advanced math concepts such as long division and pre-algebra. Mathline shows student math with their eyes and can teach the concepts of math. The student also worked with virtual manipulatives found at The National Library of Virtual Manipulatives which provides interactive, web-based virtual manipulatives or tutorials for K-12 math instruction. There is a need for good computer-based mathematical manipulatives and interactive learning tools at elementary and middle school levels. Goals and Outcomes: The teacher and student’s goals were to identify physical and virtual manipulatives to reinforce basic math functions as well as to pair manipulatives with most concepts taught in the 8th grade class. The student used many of the online math manipulatives at home prior to doing his math homework. A high school student began having more difficulty writing legibly as her disability progressed. Writing out math problems had become tiring. The student had practiced recently using her voice to complete digital assignments in Google Classroom (using Chrome extensions). The student read about MathTalk, a voice recognition program that works with Dragon Naturally Speaking. Goals and Outcomes: The student’s goal was to independently write her math problems and functions without the help of an aid or a parent. With MathTalk she can voice algebra, trigonometry, calculus, statistics, and graphing. Her assignments are recorded digitally and can be printed, emailed, and uploaded to Google Drive, or DropBox. Using her voice to type and write has increased her ability to stay focused throughout the day instead of worrying about legibility and fatigue. She is able to continue as an independent student and can work on homework independently at home without the help of an aid or a parent. Individuals who need support for math may have dyscalculia. Described as the mathematical equivalent of dyslexia, dyscalculia is a little-known disorder that makes it extremely difficult to learn math. While dyslexics struggle with reading and interpreting words and letters, dyscalculics have a hard time with basic arithmetic and understanding the meaning and concepts of numbers. A person with dyscalculia has average to above average intelligence, but has difficulty with numbers or remembering facts over a long period of time. Some persons have spatial problems and difficulty aligning numbers into proper columns. Some persons may reverse numbers, and have difficulty in mathematical operations. In 2015, 29% of 15-year-olds in the United States of America, scored deficient (in the lowest 10%) on international tests of mathematical literacy- that's 3 in every 10 students below proficiency level 2- worse than half (35) of the 69 countries tested. Only 6%, scored above 90% proficiency (level 5), worse than 36 countries. Source: NCES, 2016, p.23. For students transitioning into the community or employment settings upon high school graduation - To ensure successful AT transitions for students aging out of school services, it is important for any AT the student is currently using to be incorporated into the student's Individualized Plan for Employment (IPE). IPEs are developed through collaboration with the state vocational rehabilitation agency using a Vocational Rehabilitation (VR) Counselor. A - Learning disabilities can be divided into three broad categories: developmental speech and language disorders, academic skills disorders, and other (such as coordination disorders). Learning disabilities are disorders that affect the ability to understand or use spoken or written language, do mathematical calculations, coordinate movements, or direct attention. Learning disabilities are a lifelong condition; they are not outgrown or cured, though many people develop coping techniques through special education, tutoring, medication, therapy, personal development, or adaptation of learning skills. Approximately 15 million children, adolescents, and adults have learning disabilities in the United States. Q - What types of AT can I ask for? A - Assistive technology that is needed to do the essential functions of the job can be requested. Q - What is a “Specific Learning Disability”? A - A disorder in understanding or in using language, spoken or written, which may manifest itself in an imperfect ability to listen, think, speak, write, spell or to do mathematical calculations. Included in this category are expressive writing disorders and other expressive language disorders. Use graph paper with large graph squares to keep numbers properly aligned while doing multi-digit multiplication or long division. Allow plenty of room to write the calculations and the answer. Mobile devices (like tablets and smartphones): Mobile devices also have built-in AT. And you can add math tools to mobile devices with apps. Chromebooks (and Chrome browsers on any device): Add Chrome apps and extensions to find specific tools to help with math. Mathematical software usually takes the form of a program that is uploaded or downloaded to a computer which enables the user to complete mathematical problems of varying degrees of difficulty. Examples can be as simple as the Calculator program that is present on most Windows based computers or as complex as SPSS or SAS (statistical programs). Graphing tools are typically digital tools that help individuals graph the path created by an equation; also used with calculus and solving graphing problems. Graphic organizers help break down and lay out the steps for solving math problems. For instance, a graphic organizer for a word problem may have spaces to write and keep track of important numbers. Graphic organizers can be digital or pen and paper. Text-to-speech (TTS) will read aloud numbers and calculations when solving math problems. When used for math, TTS is often combined with other tools, like a talking calculator. Dictation such as MathTalk software, allows the individual to write out math problems by speaking. A new employee, with a learning disability, was hired to be a staff assistant at a manufacturing plant. He was doing well at most functions of the job, but had difficulty when the projects involved calculations and figuring a budget for office supplies. He had difficulty recognizing or identifying numbers and performing mathematical calculations accurately and efficiently in his head or on paper. When copying or calculating figures, he would tend to reverse or confuse number sequences. The employee discussed his LD with his supervisor and how it impacted his ability to perform certain functions on the job. They discussed that the mathematical calculations he would need to perform would be limited to adding and subtracting within excel. A building contractor with dyscalculia was inefficient when creating job quotes. To ensure the mathematical calculations were accurate, the employee spent extra time "figuring" and "double-checking" the numbers. The site supervisor purchased the Jobber 6 Construction Calculator contractor's to help the employee "figure" fractions, triangles, circles, area (and more) efficiently and accurately. https://jobberinstruments.com. The Chrome browser or Chrome book can be used to find math extensions. Use jigs or pre-measurement guides. Some work requires the use of machinery or equipment. In these cases, request that tools like jigs be used to help guide your work or help you measure more accurately. An engineer at a large company became paralyzed after an accident. Having limited use of her arms and hands, she began using Dragon Naturally Speaking voice recognition software. However, she was concerned about her ability to continue with mathematical functions. Her vocational rehabilitation counselor called the state’s assistive technology program who told her about “MathTalk”, a product that combines with Dragon Naturally Speaking but allows the individual to speak and solve mathematical calculations. She could do math without a keyboard or mouse and could use her voice for algebra, trig, calculus, statistics, and up. target="_blank">Individual has deficits in mathematics. Chromebooks and Chrome browser extensions to help with math. VoiceOver in Mac Text to Speech (TTS) can help improve comprehension by hearing it spoken. Before they start school, most children develop an understanding of addition and subtraction through everyday interactions. As Bob plays with his two-year-old daughter, he notices that she is beginning to understand the concept of addition and subtraction in simple ways. Every morning he sits with her and lines up 4 cheerios on her tray. He counts each aloud and then eats one or two. After several days, she begins trying to say the numbers and even pops two in her mouth and uses her hand to push the other two to her dad. Bob also plays with her using the shape sorter and stacking blocks. These are all math-building activities to prepare her for preschool, and for children with developmental delays, these everyday activities can make a big difference in the school readiness. Link to information about how to help you child develop early math skills. Chris returned home from serving 5 years in the military. While in another country, he sustained injuries by two IED bombs, which left him with traumatic brain injuries. While a TBI may result in cognitive, emotional, sensory, and motor impairments, this case study will address assistive technology solutions for cognitive disabilities that include short and long-term memory loss, sleep disorders, difficulty concentrating and processing information, inability to complete more than one task at a time, or organizational difficulties. Chris has difficulty monitoring his bank account, paying bills, and remembering events and other important activities. Though he may have ongoing issues in the future, he is otherwise functioning well with his wife and children. He hopes to find a job soon but acknowledges that he needs to find support and AT to help him live, function, and work independently. A retiree is living alone and must pay all of her bills independently. She has had a learning disability all of her life and has always had trouble with math. While she is not very proficient with technology, she has learned to work with specific AT to assist her. In order to assist her with her bills, she could use a talking calculator and/or a jumbo calculator. This would help her not only see it better but also easier to understand. With her new computer she could software like MathTalk so that she can dictate her budgetary needs. She could use a software program or app that would allow her to enter her exact budget information. The program will do all the math problems.